Mekorot is Israel’s state-owned water company responsible for implementing 'water apartheid' on Palestinians, including the international crime of pillage of natural resources in occupied territory, discrimination against the Palestinian people as an ethnic group and vital support for the illegal settlement enterprise. In 2005, Mekorot established a business arm to begin a process of international expansion. Several lucrative contracts have been signed in countries like the US, Cyprus, Argentina, India and Uganda. In Greece Mekorot is vying for a share in the government’s privatization drive. Cooperation agreements have also been signed in Brazil, Portugal and Italy. Civic groups are outraged that their governments are turning a blind eye to Mekorot’s involvement in violations of international law and human rights and are instead rewarding it with a business as usual approach. Campaigns have been established to kick Mekorot out in Argentina, Italy, Greece and Portugal. In Argentina, activists recently announced they succeeded in suspending the construction of a US$170 million water regeneration plant – a project which would have financed not only water apartheid in Palestine but exported it transforming access to water in Buenos Aires from a human right to a luxury item for the rich. Vitens, the largest water supplier in the Netherlands, ended a contract with Mekorot just days after it was signed due to the company’s involvement in violations of international law. Lilianne Ploumen, the Dutch minister for foreign trade and development cooperation, canceled a meeting with Mekorot officials for the same reasons. Momentum is building with the growth of the global BDS movement. It is now the time to intensify pressure on public authorities to exclude Mekorot from public contracts and hold the company accountable for its water apartheid. Join the First International Week Against Mekorot between 22 March 2014, World Water Day, and 30 March 2014, when Palestinians mark Land Day. This is an opportunity to cement an international coalition against Mekorot a worldwide awareness raising campaign. Use the week to launch campaign initiatives, promote public awareness and pressure governments to act. Register your participation by writing an e-mail to: [email protected]. A website will be set to consolidate the efforts during the week. 1. Mekorot operates a system of water apartheid: Mekorot has been responsible for water rights violations and discrimination since the 1950s when it built Israel’s national water carrier, which is diverting the Jordan River from the West Bank and Jordan to serve Israeli communities. At the same time it deprives the Palestinian communities from the possibility of access to water: Palestinian consumption in the OPT is about 70 litres a day per person – well below the 100 litres per capita daily recommended by the World Health Organization (WHO) - whereas Israeli daily per capita consumption, at about 300 litres, is about four times as much. Mekorot has refused to supply water to Palestinian communities inside Israel, despite an Israeli high court ruling recognizing their right to water. A French parliamentary report called these policies water apartheid. 2. Mekorot's vital support for the illegal settlement enterprise: Mekorot support for colonial settlement has continued since the 1967 occupation of the West Bank, Gaza and the Golan Heights. 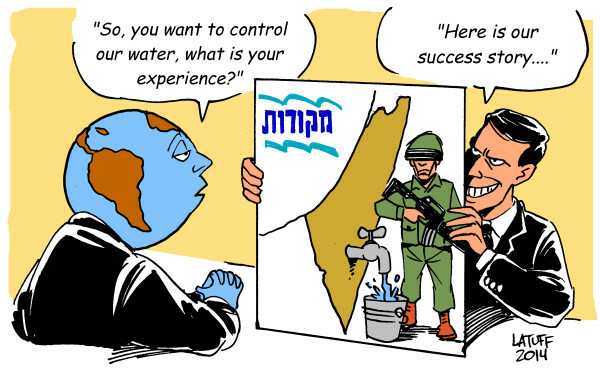 The company took monopoly control over all water sources in the occupied territories, implementing policies that bolster Israeli settlements at the expense of Palestinian communities. The United Nations report of the independent international fact-finding mission on the implications of the Israeli settlements on the rights of the Palestinian people as well as the latest report on the settlements by the Secretary-General of the UN denounce Mekorot's role in the settlement enterprise. Mekorot operates some 42 wells in the West Bank, mainly in the Jordan Valley region, which mostly supply the Israeli settlements. from Palestinian farmers and destroying the water supply sources of Palestinian communities. In 2012 alone the Israeli army demolished 60 water and sanitation structures belonging to Palestinians. In the summer Mekorot, escourted by the army, turns off the tap on Palestinian West Bank communities, leaving them to dry. Mekorot is a proud partner of the JNF’s “Negev Blueprint” plan, which will see 40 000 Palestinian Bedouin citizens of Israel uprooted from their homes into reservations and their land used for Jewish-only settlement in the Negev. 6. Mekorot’s purported 'expertise' on water is plain ‘bluewashing’: the construction of water myths intended to bolster Israel’s image abroad. Unlike what the company claims, Israel did not make the 'desert bloom'. The area of historic Palestine is rich in water and Palestinians have a centuries-old agriculture tradition. Israel exploited this myth to justify its misguided diversion of the Jordan River waters, turning the historic river into a sewage pit, and to justify aggression against neighboring countries. The reality is that Israel is a water waster, its citizens consume water double the European average and its agriculture sector is ecologically unsustainable, with government subsidized farmers growing water thirsty crops. Join the First International Week of Action Against Mekorot between 22 March 2014, World Water Day, and 30 March 2014, when Palestinians mark Land Day. Take a stand for water justice!